Many governments require visitors to obtain travel visas in order to enter their country. A travel visa is not a guarantee of permission to enter a particular country, but it tells customs agents and border officials that the traveler in question has met particular entry criteria that country has established. 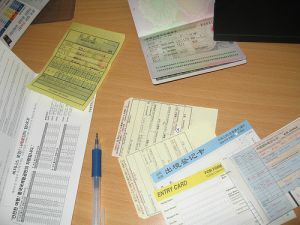 What Will I Need to Submit With My Visa Application? In most cases, you will need to apply for a travel visa before your trip begins, although some countries, such as Cuba, will issue visas upon your arrival. Expect to pay a fee – sometimes a substantial one – for your visa; you will pay at least a handling fee even if your visa application is rejected. You will need to submit your valid passport, photographs of yourself, an application form and your fee. In some cases, you will also need to provide additional documents or copies of documents. Typically, your passport must be valid for at least six months from the date of your visa application, although this requirement varies by country. The answer to this question depends on your citizenship. Your best source of information is your country's Department of State, Bureau of Consular Affairs, Foreign Office or similar agency. Consult the website of this agency or department and search for the countries you plan to visit. You should be able to find country-specific information web pages that detail visa requirements and other helpful tips. You can also consult the website of the embassy or consulate of the country you plan to visit. At the very least, you should be able to find telephone numbers to call and basic information pertaining to visas. Again, your best information source will be the embassy or consulate of the country you plan to visit. Many embassies maintain websites in a variety of languages and offer information on visa applications, fees and processing times. You can also telephone the embassy or consulate nearest your home to get information on the visa application process. Each country has specific requirements for visa applications, and fees and processes may vary based on your own citizenship. Be sure you understand the application process before you send money, passport and related documents anywhere. Allow plenty of time for delays, questions and problems. Keep copies of everything you send, and follow application instructions carefully. If the instructions do not make sense to you, call the embassy or consulate and ask for clarification. You may be able to use an approved visa processing agency if you do not live near an embassy or consulate. For example, China has approved several visa processing agencies for use by United States citizens. Carefully research this option, starting with your destination country's embassy website, before sending money or official documents to any visa processing agency. Even if your destination country does issue visas upon arrival, you may want to consider applying for your visa in advance. You will save vacation time and know you have your visa in hand before your trip begins. Sometimes peace of mind is worth a bit of extra time. Source: United States Department of State. Country Specific Information. Accessed February 7, 2012.